To discover a foreign body or ‘object’ in the ear can cause a lot of panic for the sufferer or the parent, but it should be remembered that it is actually fairly common and can range from some obscure household items to insects and bugs. The most obvious reason is because a small child has put it there. Toddlers often explore their bodies and mouths, nostrils and ears do not escape the realms of discovery. 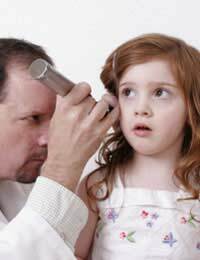 Many children try to poke things into their ears whether to see how far it will go or to suppress an itch. Items can range from fragments of toys, to pencils, pens or other small household items. Other groups of people whom seem to suffer from a foreign body in the ear are those who spend a lot of time outdoors. This may be because of sports or because of leisurely pursuits. Cyclists, ramblers and campers are all at risk of finding an unwanted companion in the ear, with flying insects being the most likely. As long as the insect does not sting, it usually only causes distress and is unlikely to cause any long lasting damage. For those whom wear hearing devices, it is possible to find that a battery has worked it’s way out of the equipment and found a new home within the ear. If your hearing aid suddenly loses all power, remember to check for the presence of a battery to rule out whether this could be the reason. As the battery or small component of the hearing device may cause a blockage and therefore hearing loss, those whom already suffer from some degree of deafness, may not realise that their hearing has been impaired further. The last group of people who are at risk, are those who persist in cleaning their ears with some sort of device, usually a cotton bud, hair grip or match stick; this action goes against all professional advice and is never to be recommended. Along with pushing wax and debris further into the ear, there is a risk of a fragment breaking off in the ear and embedding itself into the tissues causing infections. The most likely outcome of having an object in the ear is to suffer with a change in normal hearing function. If the object is causing some degree of blockage, an alteration in balance along with dizziness may be experienced. Normally, a foreign body in the outer and entrance to the middle ear will work it’s own way out, but if it doesn’t, it may become lodged in the tissues and cause an infection. Infections will often cause pain, a discharge from the ear, nausea and vomiting and occasionally bleeding if it has penetrated the tissues with a sharp edge. If an insect has entered the ear, the buzzing or humming from the insect can be very annoying and after a long period of time can become quite distressing for the sufferer. Treatment for this problem varies depending on how long the item has been there. It is important to never try to remove the object yourself, and if it hasn’t found it’s own way out after 24 hours, to seek medical advice. If the object has caused bleeding to the ear, has been inserted so far that it cannot be seen or has caused a large amount of swelling almost immediately, then please do see your GP, ENT specialist or go to the accident and emergency department. If a small child is affected, it is important to keep them calm by talking to them gently and explaining what is happening all the time. This is important to gain co-operation from the child if the object is to be removed by a trained person.Methods of removal can include the use of suction, irrigation or by using an instrument to extract the object. To suffer from an object in the ear, although normally harmless, can cause an amount of distress to the sufferer or parent. It is important to remain calm and to seek medical advice if the object does not come out by itself.